Excellent watch to give as a gift. My friend like it very much and he is been wearing it since he got as a gift from me. I recommend it highly! This masculine watch showcases a silver case with grey rubber strap. 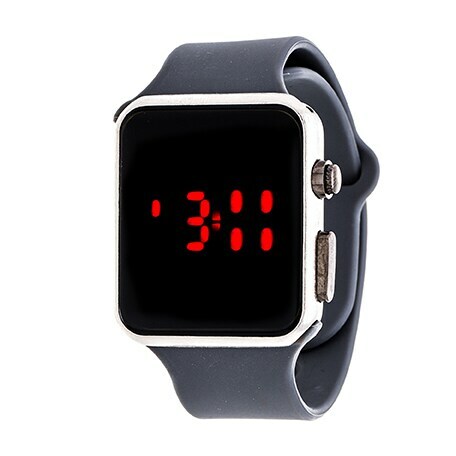 The watch is decorated with a digital display and black dial. Excellent purchase! My son loves it and having it look like an Apple watch is a plus. Perfect for time, date, and stopwatch. Good quality gray rubber band. Couldn't figure out how to attach it at first. Needed the strap to go under then through. Love the color and it is durable. bought for grandson who will be traveling overseas, and this is a great watch to keep time with. Since there are multiple time changes, this will be perfect. Good watch if U just want to know the time. The clasp is sometimes hard to work, but keeps good time. This went to grandkids and they loved it. Keeping the time it’s the most difficult thing for this watch! I know, it’s unexpensive , but if doesn’t work properly, becomes... the opposite of that. $ 15 + goes right in the garbage!!! easy to set up and a great look, it is made for a small wrist. and it will be great by the pool. "Does the display fade to be dark if you aren’t actively reading the time? Do you have to touch the screen for the time to appear?" Yes it will fade. You have to press the button to see the time. stylish design and yet affordable price.